Well, looks like a lot of the WMTM predictions turned out right, but some items that were spotted on markdown in store never made it to WMTM. I think a lot of people were hoping for the Movement Jacket, Plunge Bra and Serenity Pants/Shorts and Hoodies and Mudra Tank. I was pleased to see my guess of the Inner Heart Bra came true even though I did get that one at full price when it first came out. I made an impulse purchase tonight and decided to give the Rollin’ With My Omies Pants a try in black. Unfortunately my size wasn’t in stock so I ordered them in a size 8 and hope that they are loose enough that they will be fine a size down. If not I’ll have to sell them, or see if my store would be willing to exchange them for a 10. 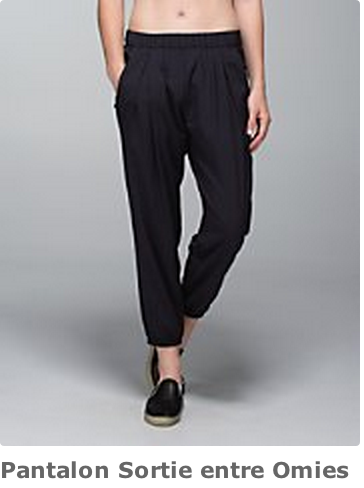 Have any of you tried these pants on yet and have some sizing insight for me? I hate taking size risks on final sale items. Did you score anything on markdown tonight? "Noir Dress, Noir Pants, Noir Bra and More"
"Heathered Jewelled Magenta Swiftly Scoop Neck, Jewelled Magenta WAFS Cool Racerback and More"